Welcome back to the review corner! This time we have 3 albums and 5 songs to talk about. This time I want to use a different format for the vocal albums: no track by tracks. Said this, let’s start! Surprise surprise, another Hyouibana based album. Did you expect it? Not me. Shoujo Rengoku 4 was in front of the spotlight and I guess everybody expected only one Touhou vocal album for this Comiket. When I saw the random Joon on Sis’ working livestream, I was expecting this album to be a Paprika-only disc, to be complementary with Daihinmin and its complete lack of cat songs. Instead, Comp does most of the job once again, but there is still space for a Pap track. Also, I was looking forward some of the missing AoCF characters: Sumireko, Kasen, Futo, Tenshi… but guess what? No one of those I named is in this album!! Instead we have a random Satori re-arrange! It’s probably meant to be paired with Nai. from the previous album, but still. It shouldn’t be here. Touhou nerd complaints aside, let’s talk about the final product. The booklet is in the same style of Daihinmin, with chibi arts of every character featured (this time no one has been excluded!). This is another album of Comp doing Comp things, but goes in a different direction of Daihinmin, sounding more pop (and i personally prefer the Shion album). 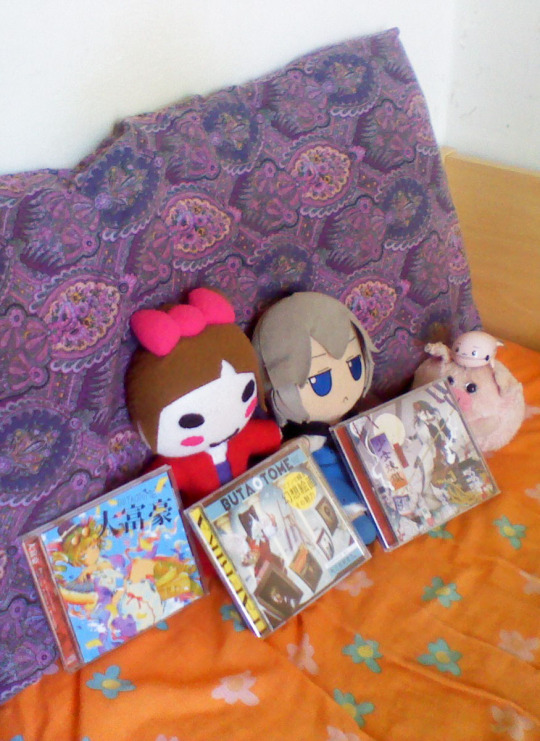 It kicks off with Fabulous: Joon’s side of Soldi from the previous album and also Ranko’s favourite track. She is still very obsessed with Joon, feel free to give her a dakimak- OK NO. The pre-refrain parts to me sound like something from a western pop song (oh no, not this again). The way the track sounds drastically different from Shion’s song and the way it complements it is very admirable. Fabulous is the key track of the album and sadly it kinda overshadows the rest. But that doesn’t mean the other songs are bad. Koumachiki, my personal fav, is short as JIGOKU but with a very rapid pace. Reimei is essentially the “Pap break time” of this album. Hashiru is characterized by a fast melody as expected from its title! And Ima Narabe’s remake sounds heavier than the original, with also some lovely 8-bits. Both vocal albums are good, but not among my favourites and I mainly focus on the tracks I like the most from them in my C94 listens. If I have to be entirely honest (and it’s hard for me to write this), I would have preferred it they focused on one album this time. Sure, we got double vocal albums from Butaotome multiple times in the past, but this is the first time I feel like this. However, as usual, I’m still eagerly waiting for what we’ll get next time! Welcome to the Gensokyo Louvre! This time Paprika goes back to basics and gives us a pure piano album. It’s been 8 years since the first 2 Nekokenbans and we can better see how our dear cat improved as pianist and in the way of arranging themes! It’s easily comparable if we take Mouja to Odoru from Neko 1 and Black Cat from this one: both are Haigoku Lullaby arranges, but the first one is a more standard take to the original theme, while the latter is happy jazzy, I love it! Anyway, just like the spellcards in the previous album, paintings are the form of expression of their artists, and with this album Paprika tried to represent them in music, associating them to a fitting Touhou character/theme. As a result of the good variety of works chosen, this is not a melanchonic/sleep inducing album. The booklet has Touhou parodies of some of the referenced paintings. Miko Scream makes me laugh because WHY. I would have loved to see more of them (for example a Lily White based on Mucha’s Spring), but the Sis is trying to git gud. Jokes aside, I can understand that she wasn’t able to do every single painting because of time and other reasons. But judging from what she did this time… Sis, you got gud! From one of AreaZero newest Touhou compilations. Is this the next Touhou vocal album preview? Probably, since AreaZero tracks get recycled almost immediately. I’m expecting Butaotome’s C95 vocal album to be a Me Violet Detector-based disc. And since Sagume is in the game, this song can be included (unless they pull another Satori or just do random themes as usual). Back to the track, its refrain is very similar to Soldi. And while I enjoy it a lot, it lacks a bit of that vibe and powerfulness of other songs made for Sky Arena. Song for Melonbooks’ Steampunk-themed compilation. First of all, I want to thank Robin who managed to get in touch with a good soul and shared the lyrics with me ❤ They are up on its page. I admit I was very disappointed by the previews: the image was just a generic Momiji artwork with a vague gears background, while the song sounded like Hiyowa na Tooboe 2018 version. With the full version… yes. It’s Hiyowa na Tooboe 2018 version indeed: Ranko’s singing and the way the original theme has been arranged are the same of the song from Tasogare Elegy. But I appreciate a lot the technological touches (like what sounds like the sound of a cassette being put and ejected in the intro and outro), keeping it in line with the “steampunk” theme of the compilation! Oh, and the MoF sirens are back once again. The pink monster comes from Ongeki, Sega’s latest rhythm game. I was hyping this track ever since Jae told me “oh hey, Ongeki will have a new Butaotome song!! I found a Butaotome news before you!!11”. Then, when someone finally uploaded a gameplay video, I was shocked to hear it was a freaking instrumental. Sure, it has a bit of the “sachlich syndrome” and I would love to hear a vocalized version, but it’s still good Comp stuff and very enjoyable in this way. Toumei Justice is the new Gitadora song. It was playable during the location tests for the new version of the game last July and a good soul uploaded a video of it on twitter! The quality was not great, but it can give us an overall idea of the song (also, did I just hear RAJIKARU!?). It’s characterized by a quite menacing pre-refrain and some lovely fast refrains. The game will be out on Wednesday and I can’t wait to hear this song in its full HQ glory. It’s gonna be one of the best music game tracks! Masshiro na Kutsu was made for the PC version of Sound Voltex. It gives us a kinda weird title (literally is “pure white shoes”), but I think it’s a representation of something that becomes dirty very easily. I can’t find words to describe it, I was not really impressed by it when I first listened to it but then I found myself looping it once I found a version without SFX and effects from the game. We probably won’t get a new major/original album this year, but the rhythm games are giving us some great material to fill the wait! But to conclude this part… Original OtoGee Best when? Aaand that’s all! What’s coming next? Well… I recently got a request about writing a Butaotome article for something and I want to focus on that. I will give more details in future! I will probably work on the PV retrospective next month. My boyfriend Scott (yes, it’s official now!) will visit me and we’ll do a marathon of all the PVs!